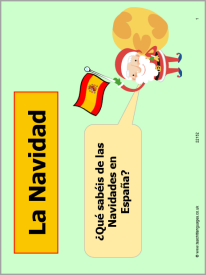 This PowerPoint introduces some key vocabulary and traditions for a truly Spanish Christmas. A gap fill and some true or false reading sentences highlight some of the different festive traditions in Spain. Some higher-level quiz questions are also provided – dictionaries may be required and iPads might be useful to research these traditions further.